For nearly half the year in Canada, snow comes and snow goes. After a long and chilly winter season, most property owners are much happier to see it go. 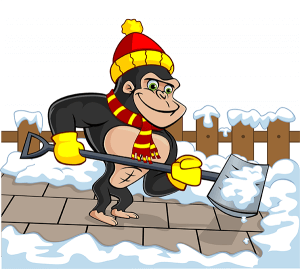 If this is you, our Gorillas have good news: you can ditch that snow quicker than you think. Our Vaughan snow removal and salting services can take the bite out of winter, without you lifting a finger. All over Canada, it is extremely easy to track down a snow removal service but finding the right one for you can be tough. A proper Vaughan snow removal and salting service not only works for your property but works alongside clients to make sure all of your needs are met. So, what are the needs of the average snow removal client? Well, first things first, there is no average client! Each and every property that we service has its own individual needs to be met and catered to. That is why our services can be made to fit your commercial, residential, multi-unit and strata properties. Gorilla technicians not only operate during the daylight hours but are available for 24/7 emergency call-out services. Snow most commonly falls during the late night or early morning hours, while ice does the same. With that in mind, something as simple as a Vaughan snow removal and salting can mean a world of difference to your home or business. Slips and falls can be prevented with one phone call to our colour-clad Gorilla technicians. No matter the time of day (or night) that our Gorillas are servicing your space, your can could on quiet, non-invasive service with expert results.